Bismuth is a silvery-white metallic element with a pinkish tint on freshly-broken surfaces. Its chemical symbol is Bi, and its atomic number is 83. Bismuth was long thought to be a variety of lead or tin, which it resembles, until the chemist Claude Geoffroy showed in 1753 that it is a separate element. Bismuth is rarely noticed in everyday life. Unlike the more common metals such as copper, lead, and iron, bismuth is rarely noticed by the average person. Bismuth is relatively brittle for a metal. It has the interesting physical property of being less dense as a solid than it is as a liquid. The only other common substances which expand when they freeze are antimony metal and water. This property of expanding when cooling is responsible for much of bismuth's commercial uses. Bismuth is a poor conductor of electricity and heat (scientists say it has poor electrical and thermal conductivities). It is relatively stable and does not corrode in the atmosphere, unless attacked by strong acids. Bismuth is not known to have any role in either plant or animal life functions. Importantly, bismuth is non-toxic (not poisonous), unlike lead and most other heavy metals. Naturally-occurring bismuth metal (known as native bismuth) is rare in nature, and does not occur in large enough quantities to be mined as a source of bismuth. 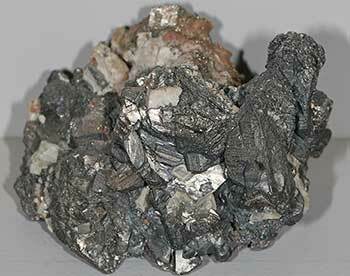 More often it combines with other elements to form minerals such as bismithunite (bismuth sulfide, Bi2S3) and bismite (bismuth oxide, Bi2O3). The name bismuth is derived from the old German word wismut, meaning white metal, or meadow mines. 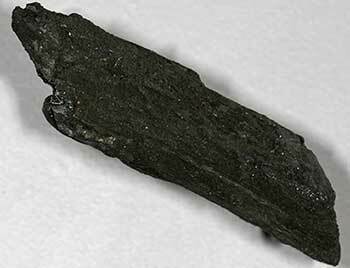 The name wismut occurs in German records dating to several hundred years before the metal's identification as a separate element, indicating that its special properties were recognized early. The most common bismuth minerals are bismuthinite and bismite. Generally, these and other bismuth minerals occur in minute quantities within ores of other metals, such as gold, silver, lead, zinc, and tungsten. Bismuth is usually an indicator of high-temperature mineral deposits, forming in veins with quartz and various metallic minerals, or at the contact of granite intrusions with other rocks such as limestone. Most bismuth is produced from mines in China, Mexico, Peru, and Bolivia. Only one Bolivian mine was a primary bismuth mine; in other countries the bismuth is a by-product of mining other metals. In addition, an important part of world production is from the small amounts of bismuth in ores of other metals, which is recovered in Belgium and Japan from foreign ores which are shipped to those countries for smelting. The United States does not produce any bismuth, except small amounts through recycling. Recycled bismuth makes up less than 5% of U.S. consumption. Bismuth is a moderately priced metal, costing more than copper, lead, and zinc, but much less than gold or silver. Bismuth is used in a number of very different applications. Almost none of the uses is for pure metallic bismuth. The majority is consumed in bismuth alloys, and in pharmaceuticals and chemicals. The remainder is used in ceramics, paints, catalysts, and a variety of minor applications. Bismuth and many of its alloys expand slightly when they solidify (freeze). This allows the bismuth to fill all corners of a mold to form a perfectly sharp replica of the mold or the item being replicated. This is also a valued property when used in soldering or plumbing (joining of pipes). Many bismuth alloys have a low melting point, sometimes even below the temperature of boiling water. Thus a bismuth-alloy casting can be covered by plastic or other material to form an intricate machine part. The bismuth-alloy core is then removed by simply melting it in hot water and pouring it out. The use of low-melting bismuth alloys is widespread in sprinkler systems in buildings. When the alloy melts in fire-heated air, the sprinkler becomes unplugged, and water sprays the fire. This application accounts for over one-third of the bismuth used in the United States each year. Bismuth metal is relatively inert and non-toxic. It has replaced toxic lead in many applications such as plumbing, bullets, birdshot, metal alloys, soldering, and other applications. Fourthly, many bismuth alloys are relatively soft and malleable. Malleable means that a metal can be hammered into thin sheets Bismuth is alloyed with iron to create what is known as "malleable irons." Bismuth compounds are used in stomach-upset medicines (hence the trademarked name Pepto-Bismol), treatment of stomach ulcers, soothing creams, and cosmetics. Industry uses bismuth in a variety of other applications. Bismuth is a catalyst in the production of acrylic fibers. Bismuth replaces lead in some ceramic glazes and paints, because bismuth is non-toxic. Substitutes for the medical applications of bismuth include magnesia, alumina and antibiotics. Scientists have discovered that a glass bulb filled with glycerine can be used in place of bismuth as the triggering mechanism for fire sprinkler systems. The element indium can be used in place of bismuth in the manufacture of low-temperature solders. However, indium is extremely expensive, whereas bismuth is much cheaper.